Comic Book Guys First Appearance.Also in this Episode: Bart, Milhouse and Martin each pitch in to buy an expensive comic book, which has disastrous results on their friendship. Milhouse has to use the bathroom in Comic Book Guy's Android's Dungeon and has to purchase a comic book first.Also in this Episode: More series of vignettes highlights a day in the life of various Springfield residents. A Neutron Bomb is about to hit Comic Book Guy and his Reaction is Hilarious.Also in this Episode: In "The Homega Man," Homer battles mutants after Springfield is annihilated by the neutron bomb. Then, Bart has his DNA mixed with a fly in "Fly vs. Fly." Finally, Marge is revealed to be a witch in colonial Springfield in "Easy Bake Coven." Comic Book notices everything the Simpsons are doing that they have already done in previous episodes.The Simpsons get an abused horse and make him a contender in horse racing. Homer finds out a secret conspiracy about jockeys. Lisa tries to reach President Clinton when the results of a school band talent competition seem tainted. 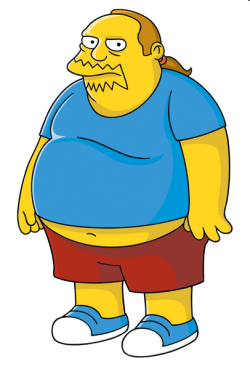 Comic Book Guy is the Evil Collector in "Desperately Xeeking Xena. "Also in this Episode: The Simpsons attempt to cover up their accidental murder of Ned Flanders in "I Know What You Did-Iddly-Did".Finally, Homer's incompetence causes a Y2K apocalypse in "Life's A Glitch, Then You Die." Comic Book Guy Dates Skinners Mom, Agnes. Also in This Episode: Bart and Milhouse are left in charge of the comic book store after Comic Book Guy is hospitalized. Stan Lee Won't Leave Comic Book Guys Store.Also in this Episode: Bart's comic about Homer becomes a hit on-line, prompting Homer to attempt to control his anger. Mrs. Krabapel falls for Comic Book Guy and they plan a Star Trek like wedding.Also in this Episode: Principal Skinner and Mrs. Krabapple are going to marry. At his bachelor party Skinner admits having cold feet about the wedding. Comic Book Guy Reveals his real name.Also in this Episode: A video of Homer dancing becomes so popular that all major sports players hires Homer to design celebration dances for them. A New Comic Book Store opens and Comic Book Guy Loses all his Business.When Marge becomes a successful businesswoman, Homer becomes worried that she will dump him for a trophy husband. Therefore, he decides to have plastic surgery to make himself look like a hunk.